These homemade chocolate Brazils may not be quite as healthy as the sugar-free We Should Cocoa challenge I have set for January, but they were jolly delicious and contained only a small amount of sugar. They are also suitable for vegans. Brazil nuts are high in selenium, a trace element we are short of in British soils. This is a shame as it’s reputed to be mood enhancing, immune system boosting and has anti-cancer properties. It’s also said to be good for the skin and circulatory systems. The chocolate coating I used was a dark 72%, so it can also said to be quite healthy, really. There was plenty of chocolate left over from making the rosemary chocolate truffles last month, so I thought I’d try experimenting with my own version of homemade chocolate Brazils. 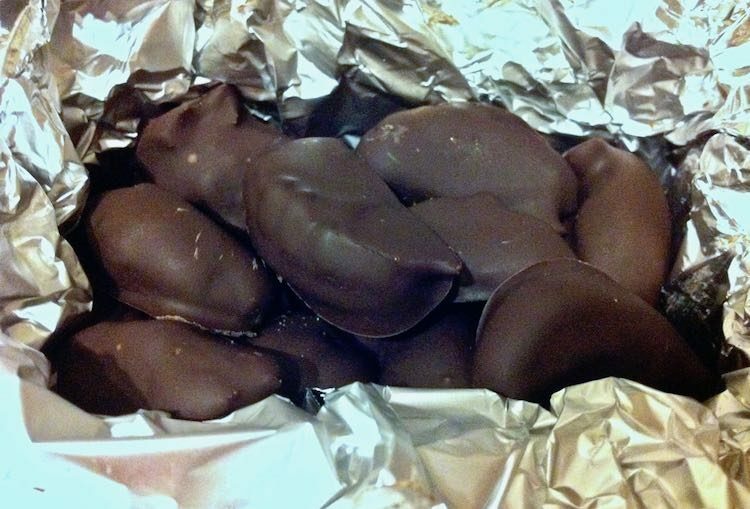 I envisaged a Brazil nut coated in crunchy caramel then enrobed in dark chocolate. I just needed to see if I could make it happen. These homemade chocolate Brazils turned out exactly as I hoped they would and they were truly delicious. I was so tempted to save them all for myself, but I womanfully packaged them up into bags and boxes along with the truffles to be given as Christmas gifts. CT did get a bag of them in his stocking and he generously shared, so I didn’t do too badly after all. 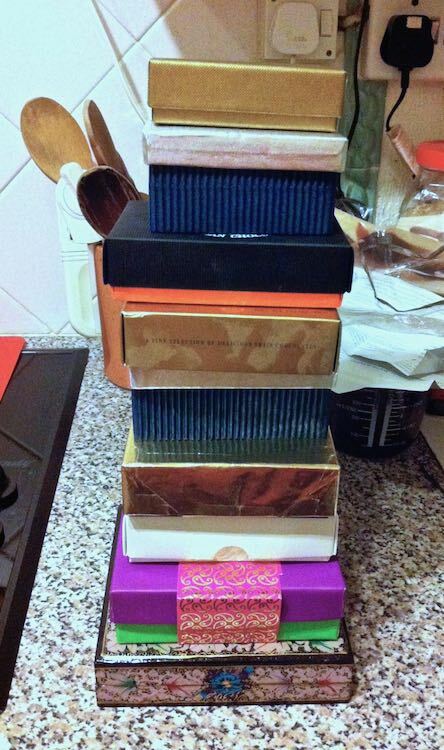 My Christmas chocolates made a surprising nine boxes of chocolates plus one bag – not a bad total. These Brazils are easier to make than you might expect. They're a definite step up form traditional chocolate Brazils and make an excellent homemade gift, especially at Christmas. Pour the sugar sugar into a large pan and place over a low heat. When the sugar has liquified and turned a light caramel colour, add the Brazil nuts and stir to coat. Pour onto a wooden board and quickly separate out the Brazils so they don't stick together. Leave for a few minutes to set. Melt the chocolate slowly in a bowl set over a pan of not quite simmering water, stirring once the chocolate has nearly melted. Dip the caramel coated Brazil nuts into the chocolate and place on some greaseproof paper to set. Place in pretty boxes or tie up in cellophane bags with a ribbon. For a salted caramel version, add a pinch of salt to the sugar as it caramelises. Swap milk chocolate for dark, if you prefer, or use a mixture of both. If you want the chocolate Brazils to last a few weeks, you'll need to temper the chocolate. Otherwise, they should be good for a few days. Thanks for visiting Tin and Thyme. If you make these dark chocolate covered Brazil nuts, I’d love to hear about it in the comments below or via social media. Do share photos on social media too and use the hashtag #tinandthyme, so I can spot them. For more delicious and nutritious recipes, follow me on Twitter, Facebook, Instagram or Pinterest. 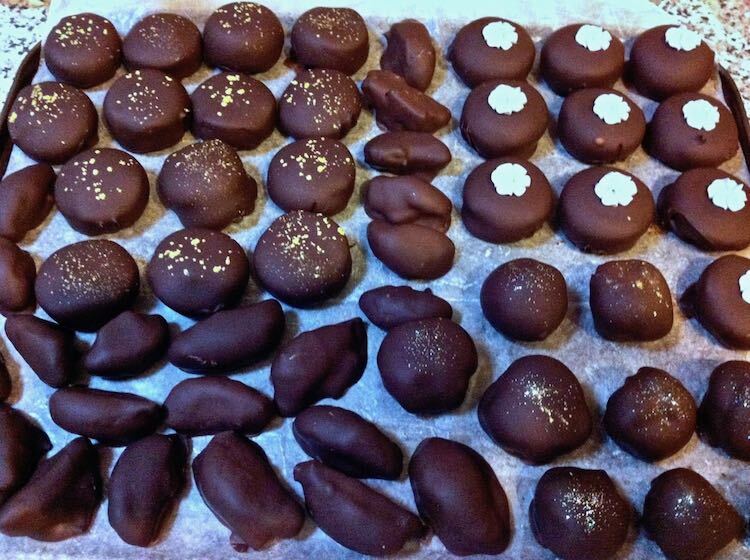 Homemade Chocolate Brazils. PIN IT. They sound wonderful! I used to get macadamia nuts given a similar treatment and they were so delicious! I used to love those boxes of chocolate covered brazils you used to get, with them all lined up neatly in rows… my grandma used to bring them to London when she came to stay… LOVED them!… yours look wonderfully rich too and I think they are quite healthy too!… no? 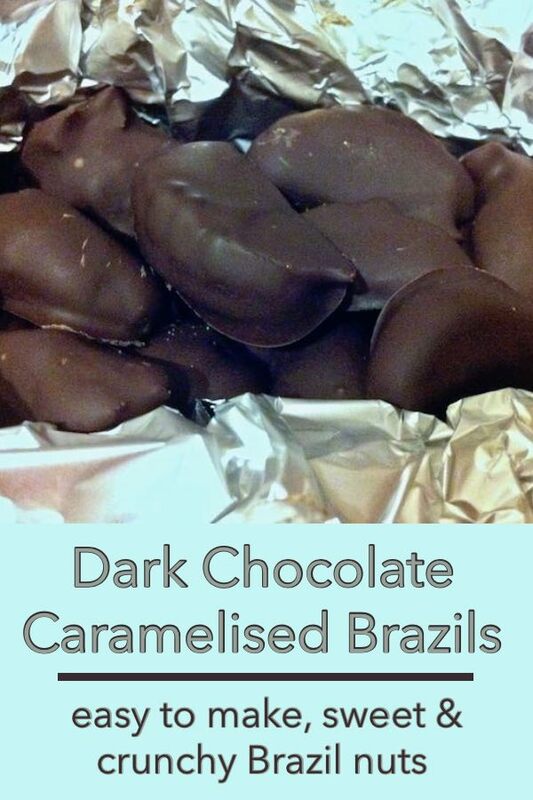 Chocolate brazils are my husband’s favourite and these sound even better with the caramel. Well done on managing to part with them too! I love chocolate brazil nuts and I like the sound of the caramel layer as well, not sure I would have been so good at letting them go though! These look just divine, especially with the praline. I didn’t make any foodie Christmas presents this year 9to my shame) – I would have bee delighted to get a box of these, although like Jen,, I’m not sure I’d have been able to give too many of them away if I’d actually made them! I’ve often combined chocolate and nuts in recipes and even coated nuts in chocolate but I’ve never used brazil nuts for inexplicable reasons. I must correct that. Happy New Year. Yum! They look lovely. I love the look of the boxes too, I would have been very happy receiving one of them.